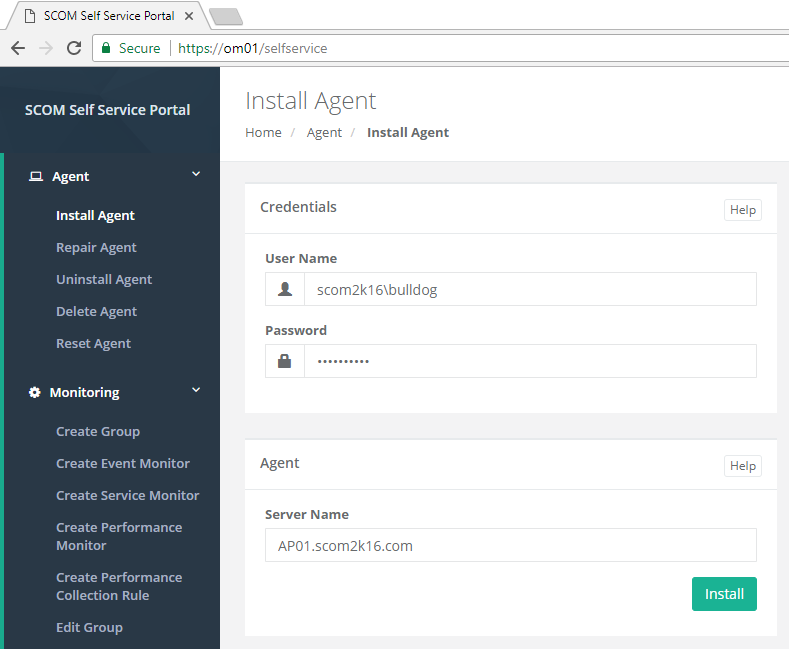 Imagine a world where server and application admins can install and maintain their SCOM agents themselves. Imagine if they could quickly and easily create their own groups and then create new monitors and rules against them. Imagine if they could create their own maintenance schedules and instantly put servers into maintenance mode with a click of a button. This is all possible with the new SCOM Self Service Portal. The new portal is built with HTML 5 and the latest web technologies and works with SCOM 2012 R2, SCOM 2016, and SCOM 1801. Users can install, repair, uninstall, delete and reset agents. No longer do you have to be a SCOM admin to do this basic functionality. 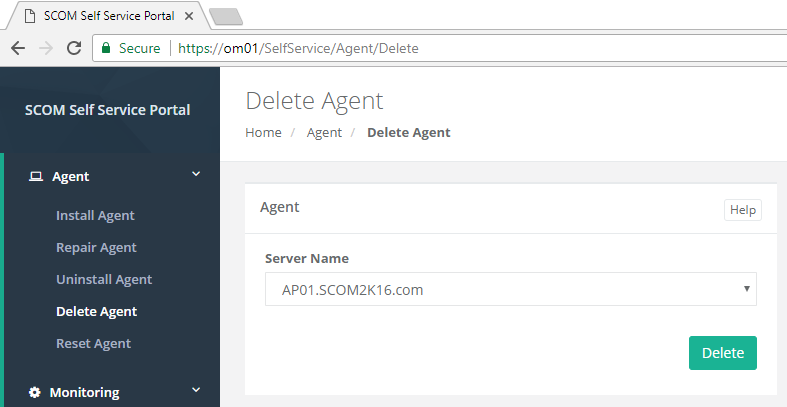 Users are empowered to maintain their agents; the SCOM admin will no longer have to perform these tedious and time-consuming activities. Users can create and maintain their own groups. With these groups they can then build their own event, service, and performance monitors. They can also build their own performance collection rules. All the difficult concepts to teach a user how to author their own monitors and rules is removed. Users can create and maintain their own maintenance schedules from a website. Users can instantly put servers into maintenance mode without using or installing the console. They can easily call the website from a script to use with their maintenance process. A user with local admin privileges to a server, types in their username, password and the server they want to push to. The agent and the latest installed update roll-up are pushed from SCOM to their server. An application or server admin can now delete their servers out of SCOM after they have decommissioned their server. No longer having to get the SCOM admin involved. Users can now create their own groups of servers. They can use these groups for targeting monitors and rules. When a group is created. 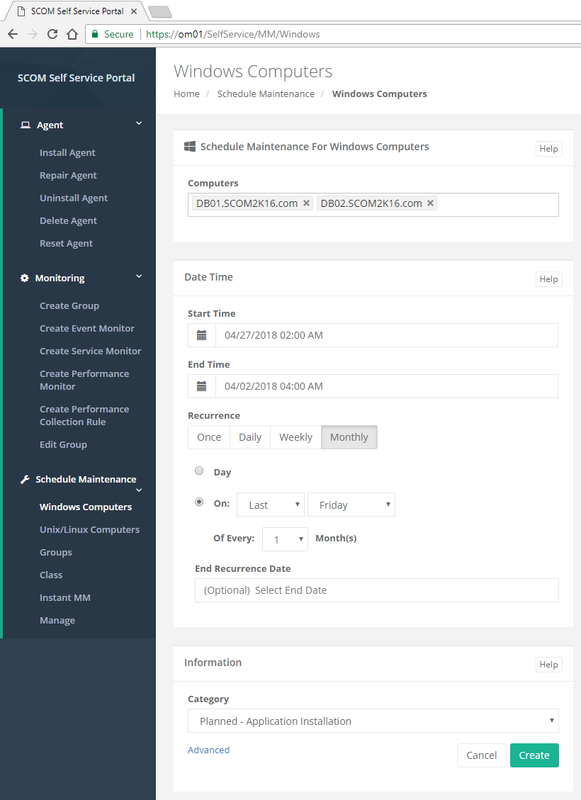 A new management pack, class, and basic views for Alerts, Performance and State are created automatically following management pack best practices. A user can create an event monitor by selecting the group of servers they want the event monitor to run on. Then they type in the information from the event they want alerted on. 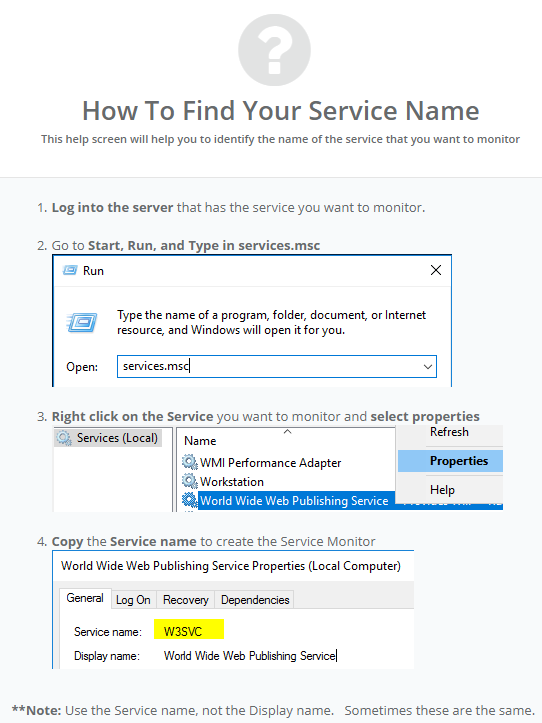 A user can create a service monitor by simply picking the group and typing in the name of the service. A user can schedule future maintenance on their servers. 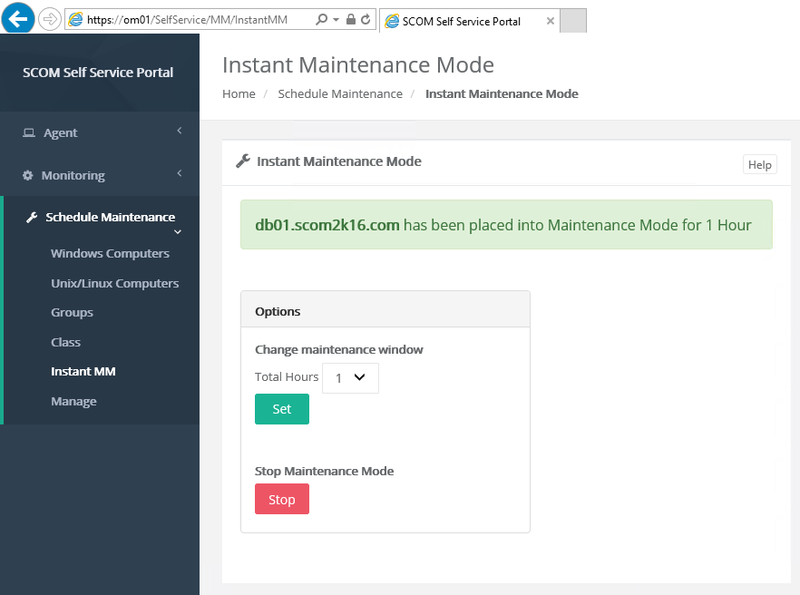 This solution makes it easy for IT staff to put a server into maintenance mode without having to go to the SCOM console. On any server, the administrator can visit the Instant MM website. Creating a shortcut on the desktop of the servers can make it even easier. With one click a server will be put instantly into maintenance mode. Anytime a user is confused or needs help. They can click the help button on any screen to get detailed help. Do we need to run it from a Management Server only or can run the setup from any Server and then connect to Management Server with necessary credentials. It is a double hop as the first hop is from the Web Server to the Management Server. The second hop it from the Management Server to the DB server. If you install it directly on a MS server its only one hop and doesn’t require any special configuration. Wow! Really, really good. Can’t wait to try it out. whats the security model for the self service page ? Is it role based ? 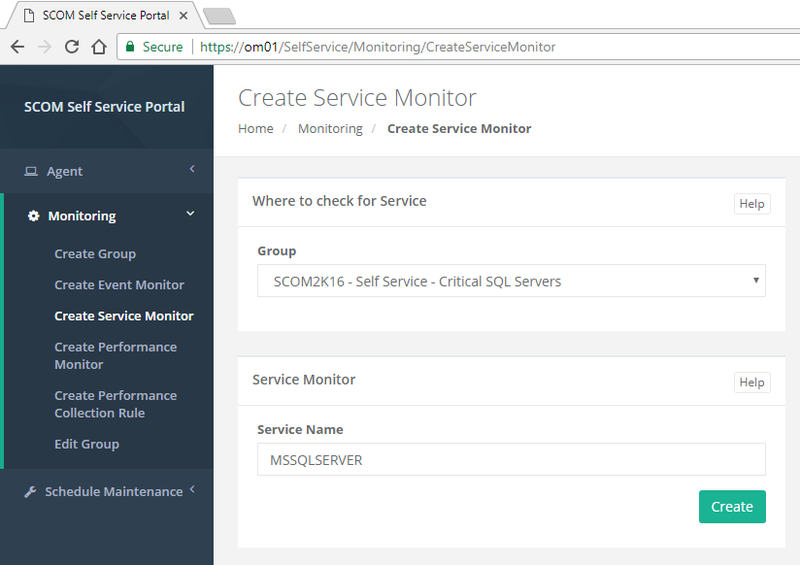 Do all portal users need to be SCOM Administrators? No portal users only need to have SCOM Operator Access. The users will only have access to computers they have been granted to in SCOM. If they want to push and agent. They will need local admin access on the server they are pushing too. One of the goals of the portal is to prevent giving SCOM Admin Access to anyone. Thx for the response. 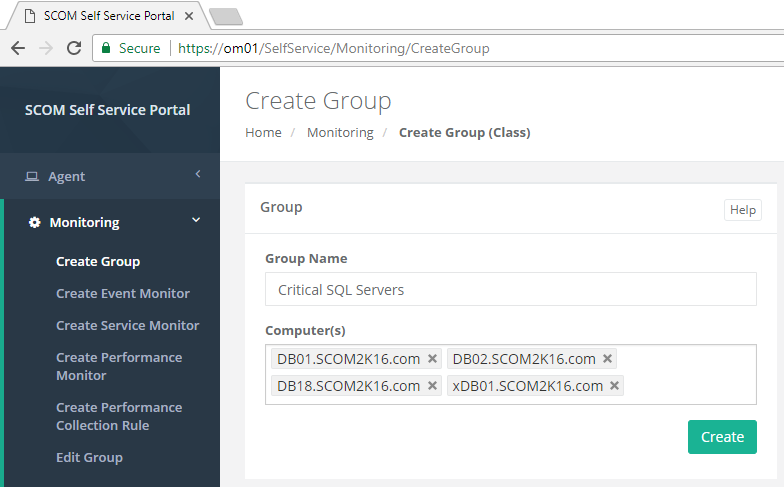 Wont creating Groups & Service monitors require SCOM Authoring Rights? Can the features on the portal be restricted? Ex: Is it possible only to grant Agent install & Maintenance mode features to a Portal user? No authoring rights required. It was built with the goal of giving users the ability to create monitors with no knowledge of SCOM. Everything is contained in a single MP and the user can only build a Group (Class) containing servers they have access to. When they create a monitor, it will only target and create alerts against their servers. They can shoot themselves in the foot but not everyone else. If the SCOM admin is not happy they could easily rip out that MP. As for logging, everything the user does is logged and stored in SCOM with their username. It would be easy to identify who did what. You can hide features using the Admin page. Whats the pricing model for this tool ? For example PT “Production Test” Environment and PR Production environment. Customers typically install it in both environments. That way the can test new versions before they deploy to production. "Enjoying the tool quite a bit. Much easier to use than scheduling in orchestrator." "Its exactly what I need especially to provide admins not familiar with scom (and even those that are!) a quick and easy method of applying maintenance mode." "Great work I must say. This is by far the best MM tool for SCOM ever." "SCOM 2012 & Maintenance Mode: Finally Fixed!"